Councilmember Sally Bagshaw will be joining our series, Unpack: Advocacy, to discuss what advocacy looks like in our city. With an insider's view of the problems Seattle is experiencing and the work being done at the Seattle City Council, Sally will speak to current issues facing our community and will invite us to ask how our daily actions can advocate for change. All are welcome! We will meet at 415 Westlake Ave from 7-9PM on these dates: May 1st and June 5th. All webinars will be at 10:00am PST. Instructions will be sent out three days prior. 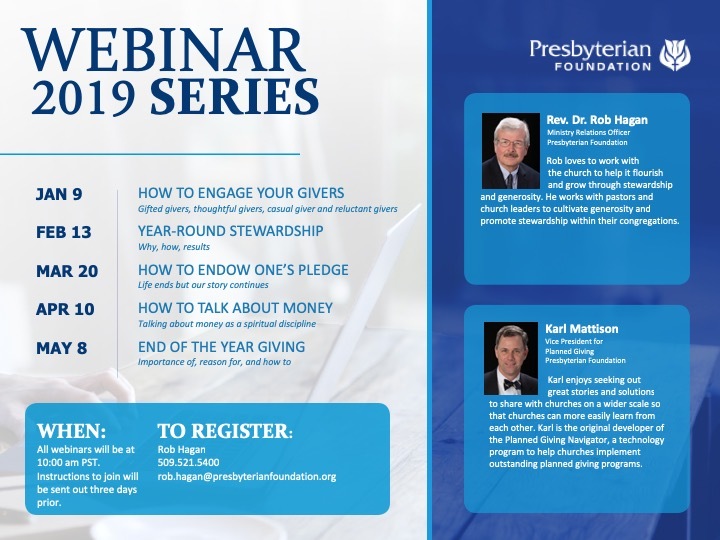 Register: Rob Hagan, 509.521.5400, rob.hagan@presbyterianfoundation.org. for PC(USA) ministers or employees is welcome. and network with colleagues from other churches. Lunch will be provided, and parking is complimentary. Register & learn more online. The Bible shouts God's love for all people! But how can all people experience this love in faith communities? Come join us at a one-day conference as we learn from experts and one another to be more intentional in our corporate worship. Synod Presbyterian Women will gather at Meadow Springs PC in Richland, WA on May 16-18 for their 2019 Spring Gathering. Did you know that 1 in 4 people have a connection with mental illness? In a desire to open up the conversation about anxiety, a film called Angst will be shown at the Vashon Presbyterian Church on Saturday, May 18th at 9am. This will be free of charge. It is felt this is a film everyone should see whether or not anxiety is a part of one’s experience. As noted above, it is rampant in our society and many are walking next to us daily experiencing anxiety. “Angst is a powerful and positive message for students, teachers and parents. The genuine and authentic comments from the young people as well as the professionals in the movie really resonated with our students and our teachers. Not only does ANGST name the many faces of anxiety, and offer tools for taming anxiety, it helps the audience understand that it is OK, we’re not alone, and we can change the narrative with the right supports. This movie needs to be seen by educators and parents so we can help our young people face their fears, and by all young people so they begin understand how to calm their fears, face their anxiety and thrive in life. “ . “Angst is the most important, eye-opening documentary you will see this year. Through first-hand accounts and expert commentary, the film leads you with great care through the many facets of teen anxiety, a massive, misunderstood and rapidly growing cultural epidemic. The teenagers in the film describe their suffering with stunning openness, grace and courage. I found myself reacting on two fronts. As a clinician, I was relieved that the filmmakers were able to capture what so many of my young clients are suffering in these complicated days: the bullying, perfectionism, panic, obsession, and too often, hopelessness. I was also surprised at the degree to which the film felt cathartic for me personally. I suffered significant anxiety as a teen, and felt myself moved by, and grateful for, every story. And thankfully, the film ends with the notes of hope we so desperately need. Whether you are a teenager, parent, educator or a mental health professional, you simply need to see this movie, and soon. And every school needs to screen this film. It’s that important. The film features children and young adults and how anxiety manifests itself in them. Perhaps you are thinking that you don’t have children, so it’s not something you want to see. EVERYONE in the community interacts with children in some way; whether you are a teacher, a checker at the grocery store, a clinic worker, a librarian, a neighbor, clergy, relative. We all need to get on board, so that we can respond with kindness and appropriate actions with children and adults experiencing anxiety and mental illness. There will be time for discussion following the viewing of the movie. Light refreshments will be provided. This convocation will focus on the psychological journey of Asian Americans with immigrant parents, exploring the challenges and blessings of growing up in multiple worlds. The presenter will discuss the importance of forming a personal identity, examine traditional Asian values that interfere with one’s growth as a Christian, and propose considerations of reclaiming one’s family stories. Participants will be invited to engage in small group conversations to share personal experiences and further explore topics discussed. Journeying across the ocean to the United States can be tumultuous, filled with hopes and worries. Even after arriving in the Land of Freedom, challenges can continue to arise. Dr. Huang will discuss the psychological and spiritual journey of Asian/Pacific Islander immigration. She will explore forms of cultural adaptation and changes in racial identity encountered by refugees/immigrants during enculturation. Impacts of racial prejudice and internalized racism will be examined. Dr. Huang will also address how these factors present challenges to immigrant families, their churches, and ministries. Hsin-hsin Huang, Ph.D. is an Associate Professor of Pastoral Theology at Aquinas Institute of Theology. She holds a doctoral degree in Counseling & Counselor Education from University of Missouri – St. Louis. She has been a pastoral psychotherapist since 1999, with extensive theological education and pastoral counseling training. She is a certified trauma therapist and consultant, and a recipient of a national award for excellence in pastoral counseling. Dr. Huang speaks both nationally and internationally on topics related to integration of theology, spirituality, and psychology. Lunch and Snacks will be provided. Please REGISTER by May 13, 2019 to Binh Ngyuen - msbinhnguyen@yahoo.com - (206) 965-0192, Rev. Mei-hui Lai - mei-hui.lai@pcusa.org - 424-303-9825.
as people and communities grounded in faith, working for justice. acknowledging and affirming the deep values and commitments that bind us together as The Church Council. Together we gather. Together we vigil. Together we advocate. Together we organize. Together we serve. Our flagship 100th Anniversary Community Celebration will take place at 6 PM on Saturday June 1, 2019 at Plymouth Church in Downtown Seattle. At the church where the Seattle Federation of Churches was first formed, we invite you to join us for a community celebration with reception. Please note that, in support of the observance of Ramadan, the reception will take place at 9 PM. All are welcome! We will meet at 415 Westlake Ave from 7-9PM. “Unbounded Love,” our spring retreat featuring Christian artist Kathy Troccoli with worship leader Michelle Margiotta, and teaching time led by Rev. Denise Easter and Rev. Dianna Kunce. The 9:00 a.m. – 4:00 p.m. retreat, on Saturday, April 6, will be held at North Creek Presbyterian Church in Mill Creek, WA. Created for both men and women, this one-time event will be a day of renewal, hope, and healing through song, teaching, reflection, and prayer. We would greatly appreciate your help publicizing this event at your church and in the Presbytery. You will find details about cost, lunch options, registration, and discounted hotel rooms (for those coming from out of the area) on the registration form. For additional information, go to www.renewalminnw.org or contact the office with questions by phone or email: 425.361.7953 or office@renewalminnw.org. We are delighted to have Tali Hairston (Director of Community Ministry & Reconciliation for the Seattle Presbytery) returning to speak to the Truth & Justice community as a speaker in the series, Unpack: Advocacy. 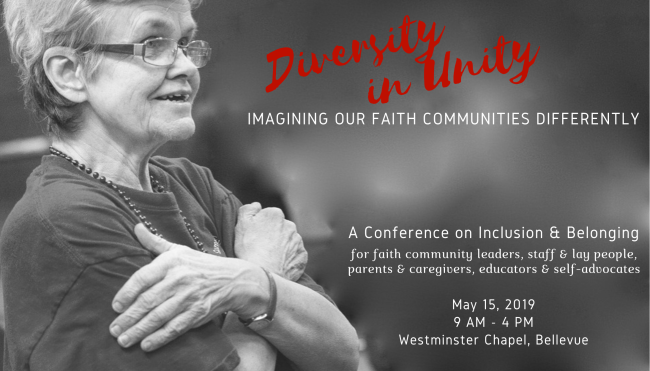 With the focus on faith and advocacy, Tali will discuss why Christians must recover a discipline of disruption for transformation and not transaction. All are welcome! We will meet at 415 Westlake Ave from 7-9PM on these dates: April 3rd, May 1st, and June 5th. This year the Annual Assembly will be in the context of an ecumenical worship celebrating our 100 years in ministry. There also will be the usual formal business including reviewing the Church Council’s 2019 budget and affirming the Board of Directors and officers of the Board. Light meal / reception at 5:45 p.m.; worship/programming begins at 6:30 p.m.
Summary:To launch our latest series, Unpack: Advocacy, Vazaskia Crockrell (WA State Director of Juvenile Justice) will be joining us to discuss her work in juvenile justice, the impact of racial and ethnic disparities, and the power of legislative advocacy. All are welcome! We will meet at 415 Westlake Ave from 7-9PM on these dates: March 13th, April 3rd, May 1st, and June 5th. An evening with Andrew Peterson! On Saturday evening, March 2, Sammamish Presbyterian Church (22522 NE Inglewood Hill Rd, Sammamish, WA 98074) will host a special evening with critically acclaimed singer/songwriter Andrew Peterson. For more than twenty years, Andrew Peterson has been about the business of quietly changing lives in four-minute increments. In the city of Nashville where music is an industry in the same way fast food, generic greeting cards, and bumper stickers are industries, Peterson has forged his own path, refusing the artistic compromises that so often come with chasing album sales and radio singles and creating instead a long line of songs that ache with sorrow, joy and integrity, and that are, at the end of the day, part of a real, ongoing, human conversation. Guest speaker: Professor William Brown of Columbia Theological Seminary, will speak on science and faith. Bill Brown comes highly acclaimed by our friends at Covenant Shores, who heard him speak last year, complete with fascinating slides and insights into what science has discovered about creation—and how it does and doesn’t fit with the Bible. According to the Bible, God’s creation cannot be described or explained in any one way. Indeed, the Old Testament alone features at least seven very different accounts of creation. In both lectures, Dr. Brown will explore three of the ways creation is described in the Bible, from the naturalistic to the poetic to the fantastic. Each way has its own wisdom to share about how we are to live in God’s creation. Friday, Feb. 15 7:30-9:00 p.m.
Saturday, Feb. 16 9:00-9:30 a.m.
Lecture - "Job’s Journey from Wound to Wonder"
Sunday, Feb. 17 8:45 and 11:00 a.m.
William P. Brown is an ordained minister of the Presbyterian Church (USA) and the William Marcellus McPheeters Professor of Old Testament at Columbia Theological Seminary in Decatur, GA. Bill has also taught at Union Presbyterian Seminary inRichmond and at Emory University. He is the author of several books and numerous essays on biblical interpretation and theology, including Sacred Sense (Eerdmans), Wisdom’s Wonder (Eerdmans), The Seven Pillars of Creation: The Bible, Science, and the Ecology of Wonder (Oxford University), Seeing the Psalms: A Theology of Metaphor (WJK), as well as editor of Engaging Biblical Authority (WJK). Bill was recently a member of the Center of Theological Inquiry in Princeton (www.ctinquiry.org), where he worked collaboratively with scientists, philosophers, and ethicists exploring the “societal implications of astrobiology.” He is currently working on a major commentary on the Psalms. Bill is an avid Sunday School teacher and was a founding member of Earth Covenant Ministry, an organization of Presbyterian churches in the Atlanta area dedicated to creation care, now part of Georgia Interfaith Power and Light (GIPL). Gail and Bill have two grown daughters, Ella and Hannah. Change happens - in interim situations and in congregations of longstanding. Build your skills with Week 1 and Week 2 of training (also qualifies as Interim Ministry Training). Cost: $699 (Includes program fee, triple occupancy room, all meals and materials. Other accommodations available; see our website for details). Want more details? Here are frequently asked questions. Q: Is this the same as Interim Ministry Training? A: It’s close, but not the same thing. Interim Ministry Training has been changing and adapting to our new cultural context for a while now. This particular training is designed to be more up-to-date with the current context — addressing the fact that every church is in some sort of transition or another. Q: Will I still “get credit” for taking Interim Ministry? A: Yes. We cover all the topics required for interim training. Also, our instructors are part the PC(USA)’s Interim Ministry Consortium (IMC). See http://oga.pcusa.org/section/mid-council-ministries/ministers/interim-pastors/. Q: So what’s different about this particular Transitional Ministry Training offering? A: Though covering many of the same topics, this offering is designed to be more immediately applicable to your current context. It addresses not just the “interim” ministry context, but many other contexts where congregational change is needed — after a long period of stagnancy, as a part of an intentional revisioning process, as a result of congregational conflict, within the context of reestablishing a new vision and mission for ministry. Q: What do you teach in Week 1 vs. Week 2? Leadership is about teamwork, but good leadership starts with you. This first four day seminar will empower you to identify and lead (or be a part of a team leading) meaningful, transformational change in any church context. Learn the basics of congregational dynamics, church systems, effective conflict resolution, power dynamics, and simple strategies for leading change in congregations. Grow as well in your awareness of yourself as a church leader, a person of faith, and gain insights into your strengths and weaknesses as a transitional leader. Once engaged in an intentional transition (Week I), transformational leaders need to be equipped to continue to lead through the rough waters of change. This second four day seminar further develops the tools of identifying the necessary change, establishing the strategies for change, recruiting a leadership team, dealing with congregational conflict, and sustaining a new culture around renewed identity.  Identify key questions for discernment.  Assess your financial readiness.  Discuss healthcare and housing options.  Create next steps in identity, relationship, housing, health, and finances. Please join Seattle Presbytery in a service of ordination for Jeny Carlson. Service location: Northminster Presbyterian Church. Please join Seattle Presbytery in a service of ordination for Jordan Uomoto. Service location: Bethany Presbyterian Church. We will spend most of Saturday at the beach learning to identify creatures in the tidal zone, in order to conduct camp’s first ever beach monitoring survey between 8 and 11pm during the super-low tide. Sunday and Monday will be filled with environmental learning and service projects, such as invasive plant removal. In between service times - we will have fun with crafts, games, stories, singing and other camp activities. *Childcare is unavailable for this meeting. Come to Sound View Camp for the SING ‘N JAM Weekend. Dust off and pack up your acoustic instruments and join others at camp for fellowship, good food, and great music which we will make ourselves. Bring ukulele. Bring drum. Bring guitar. Bring banjo, mandolin, fiddle, and dulcimer. If it can be strummed, picked, plucked, beat, or bowed then it is welcome at Sing ‘n Jam. Most important of all … bring your voice and your love for music! Sing ‘n Jam is for people who are willing to share, learn and teach others so we can all make a joyful noise. We will be serving up some amazing food this weekend to warm the toes and heart. Sure - it may be the dark of winter - but with good food, great company, cozy fires, and uplifting music - all will be well. All Seattle Presbytery Youth Pastors/Directors/Associate Directors are invited for a conversational lunch on the topic of Youth Ministry in the Northwest. RSVP by end of the day Wednesday to Lindsaym@mipc.org. You are invited to participate in the installation of Dr. Laurie Brenner as the new Pastor of West Side Presbyterian Church on Monday, January 7, 2019 at 7pm in the sanctuary. This service will be led by Jesse Mabanglo, former WSPC Interim Associate and 2018 moderator of Seattle Presbytery. George Hinman, Pastor of University Presbyterian Church in Seattle will bring the message. Former West Side pastor, Paul Smith, will give the challenge or “charge” to the congregation for how God is calling West Side to support Laurie’s leadership. Several other leaders from our Presbytery will officiate. This special service provides an opportunity to witness how the whole Presbyterian Church (USA) functions as the Body of Christ to support member congregations. Come and celebrate this milestone in the life of WSPC! Refreshments following. Celebrate the New Year with fun and fellowship at Sound View! This one night camp will feature games galore with lunch, dinner, midnight snacks, and brunch included...and an optional polar bear plunge to welcome in the new year! The purpose of this project: Unite! Youth Winter Retreat, is a collaboration of Christian youth & youth ministries for the purpose of encouraging a larger and diverse community of faith among middle, high school, and college-age youth. By participating in this event you give your youth and young adults the opportunity to feel connected to the larger church body in our Region. take a hike around camp to see the projects on the waterfront, in the woods, and at the farm. optional spend the night (dinner, campfire, breakfast) for a small fee.